Introduction to Scratch Part III: How do parents and teachers get started using Scratch? Click here for Part I: What is Scratch? The Internet gives us access to so much information that it makes it difficult to know where to start when learning a new skill. This information overload often makes it intimidating to start new projects. We find one of the best ways to get started learning how to use Scratch is to follow the tutorials built right into Scratch itself. In the desktop version of Scratch (available for free on OSX, Windows, and Linux) you can open a “help” menu that gives you step-by-step tutorials On a number of different topics. For this week’s blog post we chose the tutorial, “Create a Pong Game.” After trying this tutorial we can recommend this as a great first step to exploring Scratch. The tutorial walks you through the basics of Sprites, Backdrops, Movement, and Object Interactions. Within 20 minutes of starting the tutorial, we had built a simple pong-style game staring a cartoon version of the MakerBus. You can play our creation by clicking the image below. If you’re looking for other ways to explore Scratch, we’ve compiled a list of great introductory articles with ideas for getting started. This week’s blog post is going to be on the shorter side since the MakerBus is super busy with events and planning the upcoming renovations on the interior of the bus. 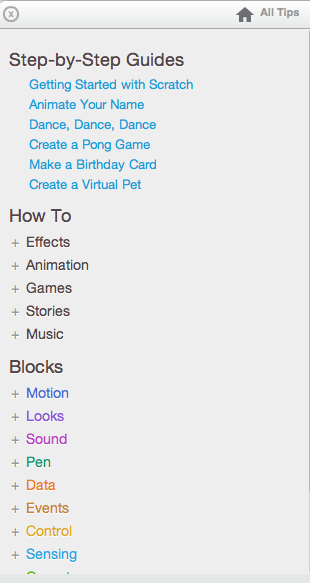 Look for a more in-depth blog post about learning to use Scratch next week.